Former president Ion Iliescu was right. Like the mystery of JFK’s assassination, which has not been solved in the last half of century, the same the many enigmas of the December 1989 events were not solved until now. How many people really died, who gave the murderous orders, who were the mysterious “terrorists,” what was the role of those who took the power? The answers given in the past 20 years to these questions are unsatisfactory, at best. Fake “revolutionists” who got rich overnight, officers who ordered the repression and then became ministers or presidential aides, the strange deaths of most of those who participated in the trial of the Ceausescu couple, the disappearance of all “terrorists”… This is just part of the picture representing a “revolution” that was disputable, at best. What remains undisputable is the phenomenon of mass protests that erupted in Timisoara, then spread to other towns and eventually to Bucharest, where they reached the climax. Without being unanimous, the anger against the communist government had significantly ramped up at the end of the ‘80s. Thus, it only took a spark to ignite the flame of a protest which rapidly put in motion large masses of people. Have they been provoked by (local or foreign) agents infiltrated into their ranks? In other words, did the protest belong to a plan of replacing Ceausescu, devised by the feared Securitate – the communist secret police? Or was it part of the larger Soviet effort aimed at exporting Gorbachev’s perestroika to the whole communist block? Or the protest was genuine, and only manipulated by those interested to take the power? Anyway, the “chaos” was big enough to allow many interpretations, even some which might seem just fantasy. Occult scenario or just an analysis of facts, any variant will remain a hypothesis, hard to prove for many years to come. Furthermore, the perspectives of the events had political connotations. Some legitimised their power by claiming they represented a mass movement, others challenged them and accused them of hijacking at least the principles that laid behind the initial protests, if not the whole events that followed. Did Ion Iliescu just happen to become the leader of the new ruling team? Or was it a coup d’etat, secretly concocted by a group of conspirators? Or was it his prestige of marginalised communist leader? All in all, there are two main enigmas related to the events of those days: who is responsible for the victims, and how did the new power take shape? The first question was followed by many partial answers, and it took Justice many years to punish some and release others that looked at least as guilty. Obvious ties connected the new and old regimes. Ion Iliescu, Petre Roman, Silviu Brucan and many others were exponents of local communist circles. Those who won the power in 1989 were neither the dissidents, nor the former political prisoners or the protesters against the communism. 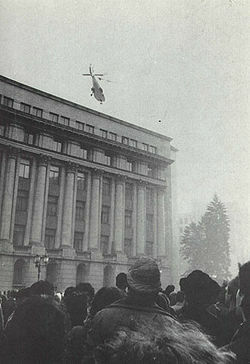 It seemed as only the reformist communism provoked the protests against Ceausescu. But those who protested, in those days of December belonged to many social categories: industrial workers who could no longer endure poverty, youth wishing to live in a different world than their parents… Some were dreaming of a more humane society, others wished to enjoy freedom like in the West. Anyway, the tie between masses and the new leaders was anything but organic. 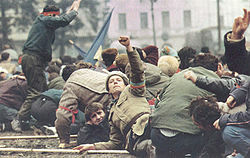 Even though Petre Roman came with the aura of a man who faced the bullets of the Securitate for a whole night, while Silviu Brucan was the protester living under forced domicile, both enjoying the approval of global powers to make a political change in Romania, nobody could say they were initially “chosen” by “revolutionists” for their merits. The idea was to put forward those who had distinguished themselves by challenging Ceausescu’s policy, one way or the other. But only few were truly ready for such a change of regime, which added to the retrospective impression of a makeshift protest. Anyway, even if the bloody events of 1989 now seem just a detail in the inexorable move by which history shattered communist regimes to pieces, the moment itself cannot be devoid of its aura of a moral experience aimed at redeeming the feeling of historic responsibility. Courage, dignity, sacrifice – these were the rhetoric terms used, for many years, to legitimise the new era through the cathartic virtues of a mass revolt. A certain spirit of freedom, gained through the revolt of people, remains a landmark of the post-communist era. On one hand, it preserved the utopia of a fundamental change, while on the other it repeatedly gave new energy to political activism. But the 1989 outburst cannot compensate the absence of a united, lucid and forward-looking dissidence.